But much of the data I want to visualize is something that I culled, compared, pared down and saved into a CSV file, so I just want to drop that file as a piece of content into my app directory & load it into my app at runtime. Select your file. 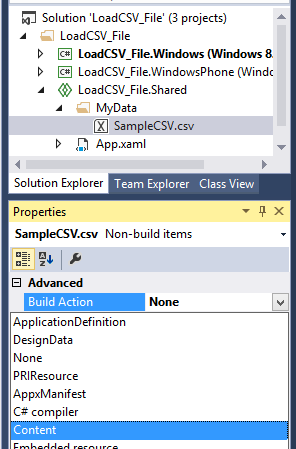 Once in the project, select it and you’ll see that the “Build Action” for the file is set to “None”. Change that to “Content”. Now add the following to read the CSV into a list of data objects. This entry was posted in c#, visualization. Bookmark the permalink.